He began his career at hometown club Standard Liège, making 183 appearances and scoring 42 goals while winning five domestic trophies. He was awarded the Belgian Golden Shoe in 2008. After a season in Portugal with S.L. Benfica, he signed for Zenit Saint Petersburg for a €40 million fee in 2012. Witsel won four honours during his time in Russia, before leaving for Tianjin Quanjian in January 2017. He returned to Europe with Borussia Dortmund in August 2018. Witsel made his senior international debut in 2008 and earned his 100th cap for Belgium on 15 November 2018. He represented the country at the 2014 FIFA World Cup, UEFA Euro 2016 and the 2018 FIFA World Cup, helping them to third place in the last tournament. 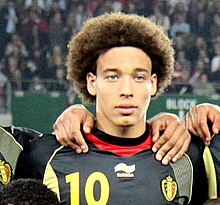 On 17 September 2006, a 17-year-old Witsel made his debut with Standard Liège during a competitive game against FC Brussels when he replaced Steven Defour in the 89th minute. Eleven days later, he made his European debut as a substitute. During the 2007–08 season, at 18 years of age, he was a key member in the squad of Standard Liège, winners of the Belgian League title that year. During this year, he formed a very young midfield together with other Belgian talents Defour and Marouane Fellaini. In the following season, he scored the winning goal from the penalty spot in a two-legged playoff to decide the championship. On 30 August 2009, Witsel sparked controversy when he broke Marcin Wasilewski's leg by stamping on his ankle during the match between Anderlecht and Standard. Following the tackle, Witsel protested the red card, claiming that it was an accident without intent, before being sent off the pitch. He soon apologised, but was the subject of criticism from several media outlets and numerous death threats from angry Anderlecht and Poland fans. The initial ban until 23 November by the Belgian Football Association, was later reduced on appeal to eight matches. Witsel signed for Portuguese club Benfica on a five-year deal on 13 July 2011, including a €40 million buyout clause. Witsel scored twice in the 3–1 win against FC Twente, in the Champions League play-off second leg, on 24 August 2011, sending Benfica to the group stages with a 5–3 aggregate victory. He scored the opening goal in a 4–1 thrashing of Vitória de Guimarães in the Taça da Liga on 9 January 2012. He then assisted Nolito in a 4–1 league defeat of Vitória de Setúbal. Witsel scored his fourth goal against Santa Clara on 18 January in a Taça da Liga match. Benfica reached the final on 14 April against Gil Vicente and Witsel was awarded the Man of the Match award as Benfica claimed their fourth Taça da Liga title with a 2–1 victory. On 3 September 2012, Witsel signed for Zenit Saint Petersburg for €40 million, after signing a five-year contract. Witsel made his debut in the Russian Premier League on 14 September, replacing Konstantin Zyryanov in the 70th minute as Zenit fell 2–0 to Terek Grozny. He scored his first two goals for the club on 30 November when Zenit brushed aside Spartak Moscow 4–2 at the Luzhniki Stadium. Witsel scored Zenit's winner against Terek Grozny on 30 March 2013, an eighth-minute strike, as his side cruised to a 3–0 league victory. In Zenit's first match of the 2014–15 UEFA Champions League group stage on 16 September 2014, Witsel scored Zenit's second goal in a 2–0 away victory over former club Benfica. After finishing third in their Champions League group, Zenit were parachuted into the Europa League knockout phase; in the first leg of their Round of 16 clash against Torino on 12 March 2015, Witsel scored on a rebound as Zenit defeated the Italian club 2–0. On 26 April, Witsel scored the game's only goal in the seventeenth minute as Zenit defeated Arsenal Tula in a league match at the Petrovskiy Stadium. On Sunday 17 May, Witsel played the full 90 minutes as Zenit drew 1–1 with FC Ufa, earning the point they needed to secure the Premier League crown, the club's fourth overall and Witsel's first with Zenit. In the 2015 Russian Super Cup on 12 July 2015, Witsel converted his penalty shot in a 4–2 penalty shoot-out victory over FC Lokomotiv Moscow after the match had finished 1–1. On 3 January 2017, Zenit officially announced that Witsel has moved to Chinese club Tianjin Quanjian. On 4 March 2017, Witsel made his debut for Quanjian in a 2–0 loss to Guangzhou R&F. A week later he scored the club's first ever goal in the Chinese Super League during a 1–1 draw with Shanghai Greenland Shenhua. On 6 August 2018, Witsel signed for Bundesliga club Borussia Dortmund and agreed a four-year contract which lasts until 30 June 2022. On 21 August, he scored an equalizing goal in the stoppage time to make it 1–1 after coming on as a substitute on his debut for the club against SpVgg Greuther Fürth in the DFB-Pokal first round match and later his side went on to win the match in the extra time with a 2-1 victory. Witsel scored his first Bundesliga goal on his league debut for the club with an overhead kick in a 4–1 victory over RB Leipzig on 26 August. Prior to making his international debut for the senior side, he played for the under-21 side in 2007 earning nine caps as well as helping his side reach the semi-finals of the 2007 UEFA European Under-21 Football Championship. On 26 March 2008, Witsel made his international debut during a friendly game against Morocco. The match resulted in a 1–4 loss, but Witsel scored his first goal for Belgium. Witsel lining up for Belgium before playing Austria in the qualification for UEFA Euro 2012. Witsel's first goal in an competitive international match came a day short of three years after the Morocco goal, in the sixth minute against Austria in Group A of the UEFA Euro 2012 qualifying process, and his second would come in the second half. However, Belgian hopes of qualifying for UEFA Euro 2012 were dashed on 11 October 2011, by defeat to Germany coupled with Turkey's victory over Azerbaijan. On 13 May 2014, Witsel was named in Belgium's squad for the 2014 FIFA World Cup. He started in midfield in the team's first game of the tournament, a 2–1 win against Algeria in Belo Horizonte. Witsel also featured in the Belgian squad at UEFA Euro 2016, announced on 31 May 2016. He scored his first tournament goal during the Championships, in a Group E match against the Republic of Ireland. Axel Witsel playing for Belgium during the 2018 FIFA World Cup. He scored twice in 2018 FIFA World Cup qualification, both in wide victories over Gibraltar. Manager Roberto Martínez named him in the squad for the final tournament in Russia. In June 2015, Witsel married his longtime girlfriend, the Romanian-Hungarian, Rafaella Szabo, with whom he has two children. He is of Martiniquais descent through his father. As of match played 31 August 2017. Belgium score listed first, score column indicates score after each Witsel goal. ^ "Conselho de disciplina" [Disciplinary board] (in Portuguese). Portuguese Football Federation. 23 March 2012. p. 3. Archived from the original (PDF) on 15 July 2014. ^ "2018 FIFA World Cup Russia: List of players: Belgium" (PDF). FIFA. 10 June 2018. p. 3. Retrieved 10 June 2018. ^ "Site officiel du Standard de Liège – Accueil". Archived from the original on 27 January 2010. Retrieved 26 June 2016. ^ "Axel Witsel im BVB Trainingslager angekommen" (in German). Borussia Dortmund. 6 August 2017. ^ "Witsel breekt been van Wasilewski in tackle". Sporza. Archived from the original on 1 September 2009. Retrieved 31 August 2009. ^ "Anderlecht-Standard faute d'Axel Witsel sur Wasilewski". YouTube. Retrieved 31 August 2009. ^ "Standard Liege Stars Defour & Witsel Receive Death Threats - Report - Goal.com". 1 September 2009. Retrieved 26 June 2016. ^ "Standard Liege midfielder Axel Witsel banned for horror tackle". MirrorFootball. 1 September 2009. Retrieved 26 June 2016. ^ "Yahoo UK & Ireland – Sports News – Live Scores – Results". Retrieved 26 June 2016. ^ "V.Guimarães 1–4 Benfica". LPFP. Archived from the original on 28 April 2012. Retrieved 3 December 2012. ^ "Benfica 2–0 Sta. Clara". LPFP. Archived from the original on 1 August 2013. Retrieved 3 December 2012. ^ "Witsel foi o Man of The Match". LPFP. 15 April 2012. Archived from the original on 14 July 2012. Retrieved 3 December 2012. ^ "Официальный сайт ФК "Зенит"". Retrieved 26 June 2016. ^ "Comunicado" [Announcement] (PDF) (in Portuguese). CMVM. 3 September 2012. Retrieved 31 December 2014. ^ "Zenit 0 – 2 Terek Grozny". ESPNFC. 14 September 2012. ^ "Spartak Moscow 2 – 4 Zenit St Petersburg". ESPNFC. 30 November 2012. ^ "Terek Grozny 0–3 Zenit St. Petersburg". ESPNFC. 30 March 2013. ^ "Familiar Zenit faces come back to haunt Benfica". UEFA. 16 September 2014. Retrieved 17 July 2015. ^ "Zenit ease to victory over ten-man Torino". UEFA. 12 March 2015. Retrieved 17 July 2015. ^ "Zenit St Petersburg 1–0 FC Arsenal Tula". Yahoo Sports!. 26 April 2015. Retrieved 17 July 2015. ^ "Andre Villas-Boas leads Zenit St Petersburg to Russian Premier League title after ill-fated spells at Chelsea and Tottenham". Daily Mail. 17 May 2015. Retrieved 17 July 2015. ^ "Суперкубок России по футболу 2015, Финал". RFPL (in Russian). 12 July 2015. Retrieved 17 July 2015. ^ "Witsel will continue his career in China" (in Russian). FC Zenit Saint Petersburg. 3 January 2017. ^ "Alexandre Pato struggles as Tianjin Quanjian slump vs. Guangzhou R&F". ESPN. 4 March 2017. ^ "Witsel scores Quanjian's maiden CSL goal". MSN. 11 March 2017. ^ "Axel Witsel to join Borussia Dortmund from Tianjin Quanjian". SkySports. Retrieved 7 August 2018. ^ "Axel Witsel arrives at the BVB training camp". Borussia Dortmund. Retrieved 7 August 2018. ^ "Axel Witsel saves Borussia Dortmund on debut in German Cup". BBC Sport. Retrieved 21 August 2018. ^ "Borussia Dortmund 4-1 RB Leipzig: As it happened!". Bundesliga. Retrieved 27 August 2018. ^ a b "Axel Witsel marque, Stijn Stijnen se troue deux fois". Le Soir (in French). 27 March 2008. Retrieved 4 December 2014. ^ a b "Witsel bezorgt Rode Duivels zege van de hoop". Sporza (in Dutch). 25 March 2011. Retrieved 4 December 2014. ^ Potter, Steffen (11 October 2011). "Germany stamp out Belgium's fire". uefa.com. Union of European Football Associations. Retrieved 24 January 2018. ^ "Adnan Januzaj included in Belgium's World Cup squad". BBC Sport. 13 May 2014. Retrieved 15 May 2014. ^ Chowdhury, Saj (17 June 2014). "Belgium 2–1 Algeria". BBC Sport. Retrieved 17 June 2014. ^ BelgianRedDevils [@@BelRedDevils] (31 May 2016). ".OFFICIAL ! Our final #Euro2016 squad list & numbers ! #TousenFrance" (Tweet). Retrieved 24 January 2018 – via Twitter. ^ a b Lowe, Sid (18 June 2016). "Belgium get going as Romelu Lukaku punishes Republic of Ireland". The Guardian. Retrieved 14 October 2016. ^ Dorman, Matt (31 August 2017). "Belgium 9 Gibraltar 0: Trebles for Meunier and Lukaku as Hazard makes scoring return". Goal.com. Retrieved 4 September 2018. ^ "World Cup 2018: Belgium include Vincent Kompany but Christian Benteke misses out". BBC Sport. 4 June 2018. Retrieved 4 September 2018. ^ "Axel Witsel en très charmante compagnie". La Dernière Heure (in French). 23 October 2012. Retrieved 23 April 2014. ^ "Axel & Rafaella Witsel éblouissants lors de leur mariage religieux". Sudinfo.be (in French). 13 June 2015. Archived from the original on 25 June 2016. Retrieved 31 August 2017. ^ "Mondial 2018 - France Belgique: Axel Witsel, l'autre Antillais endiablé". franceinfo. franceinfo. 10 July 2018. Retrieved 11 July 2018. ^ Dalmat, Syanie (10 July 2018). "Axel Witsel, le Belge qui aurait pu jouer pour la France". L'Equipe. Retrieved 11 July 2018. ^ a b "Axel Witsel". Royal Belgian Football Association. Retrieved 14 October 2016. ^ "Victoire des Diables face au Qatar (0–2)". La Dernière Heure (in French). 17 November 2009. Retrieved 4 December 2014. ^ Da Silva, Christophe (9 February 2011). "Rode Duivels gooien verdiende winst weer weg in blessuretijd". Het Laatste Nieuws (in Dutch). Retrieved 4 December 2014. ^ Lynch, Michael (5 September 2014). "Socceroos easily beaten by Belgium in friendly". The Sydney Morning Herald. Retrieved 4 December 2014. ^ "Christian Benteke historic goal, hat trick help Belgium beat Gibraltar". ESPN FC. Entertainment and Sports Programming Network. 10 October 2016. Retrieved 14 October 2016. ^ a b c "A. Witsel". Soccerway. Retrieved 17 March 2015. Wikimedia Commons has media related to Axel Witsel.